Heroes and Heartbreakers initiated a series of posts about fairy tale themes/stories in romances and YA books. Naturally, the first thing that came to my mind were the futuristic fairy tales of Ella Drake, namely JAQ'S HARP and BRAIDED SILK. I invite you to read my spotlight on these books. 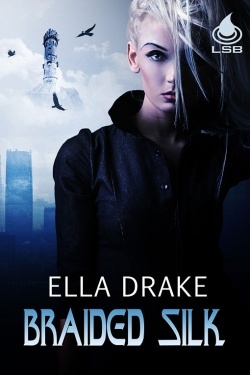 The post is called Twisted Fairytales Biopunk Theater Presents: Ella Drake's "Future Tales." Everyone is invited to read and vote for your favorite three pitches in each heat. The two pitches with the most votes in each heat will advance to the final round. If you add a comment to tell the authors what hooked or intrigued you about their pitch, we're offering a *BONUS! * All comments containing feedback in the Pitch Tournament will be entered into a drawing for a $15 Amazon e-Gift Certificate. Welcome to the first in what will be a 14 day event highlighting the Lesbian genre from the authors who write Lesbian fiction, the publishers who publish it and the bloggers who read it and promote it. Every day leading up to January 21st, there will be at least 2 posts a day promoting the Lesbian genre and why it's so amazing. I'm scheduled to appear on Saturday, January 14 with a spotlight on two f/f science fiction romances. You can also look forward to posts by authors Cathy Pegau, KS Augustin, and Jessica E. Subject, all of whom have written stories in this category.